JASON VOORHEES. Original release, complete with machete, removable mask and chain. 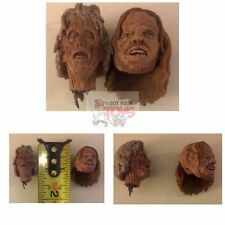 NECA Friday The 13th Part 3 3D "Jason Voorhees" Head ONLY For 7". Condition is Used. Shipped with USPS First Class Package.
" 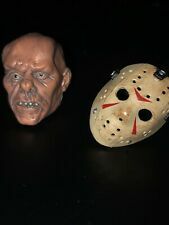 JASON VOORHEES MASKED HEAD ". Condition is Used. • I am a one man operation. I am a one man operation. • I will be adding many more collectibles,antiques,toys,fishing gear ,rc's and much more in the upcoming weeks and months! Jason Voorhees. The SDCC Set is minty . NECA RETRO. Jason Lives. Neca Jason Voorhees 19" Figure 2005 Friday the 13th . Condition is Used. Shipped with USPS Priority Mail. MISSING THE MACHETE YOU WILL RECEIVE AS SHOWN PLEASE LOOK AT PICS THANK YOU! 2009 Remake of Friday the 13th. Displayed only. Jason comes with Mecheate and alternate head. Jason's mask has been glued on the top and right side. See in photos above. If you have any questions please let me know. UNMASKED JASON VOORHEES ACCESSORIES. Every accessory is checked for the correct hands, feet and all accessories included --. Unless otherwise noted, We attempt to note any defects such as creases, major scratches, scuffs, moderate print marks and any other major imperfections not visible in the scan. There are often real gems buried here. Neca Cult Classics Hall Of Fame Jason Voorhees Friday The 13th Part 2. Complete! Condition is Used. Shipped with USPS First Class Package (2 to 3 business days).
" JASON VOORHEES ACCESSORIES ". If there are accessories in the photo, those accessories will be included with the item. About 2” tall. If there are accessories in the photo, those accessories will be included with the item. Excellent condition, display used only. Excellent condition, display used only. If there are accessories in the photo, those accessories will be included with the item. NECA Friday the 13th Jason Part 3 7" Action Figure Loose 2012. Condition is Used. Shipped with USPS Priority Mail.